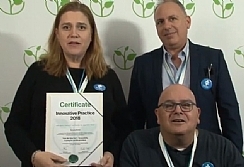 Congratulations to Access Israel for winning the Zero Project Award 2018 on Accessibility. The organization has developed a buisness model for training service providers regarding accessibility issues. More than 35,000 service providers have been trained since the start of the project in 2009. The prize was awarded during the Zero Project International Conference held at the UN headquarters in Vienna on February 21-23 .